A P Rc.No.117 Implementation of Ananda Lahari Abhyasana (ALA) in 114 Double Teacher Primary Schools in Guntur District – Identification of ALA Demo Schools in the Mandal – Certain instruction Issued. 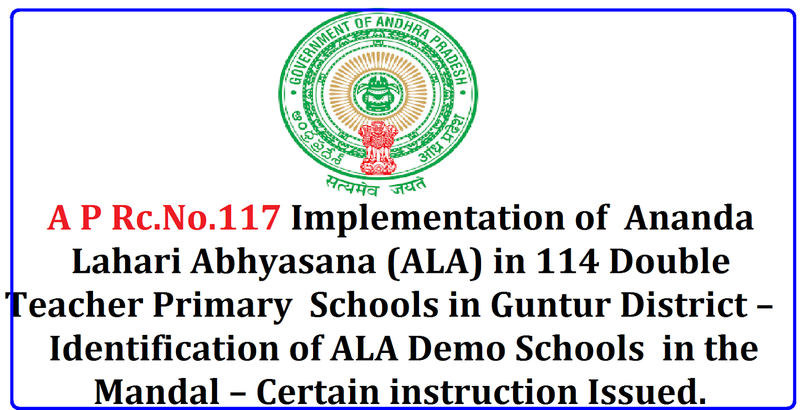 To introduce the Pedagogy in Demo Schools first, then to the rest of the ALA schools, it is planned to train 8 Master Trainers and 8 Demo School Teachers at Rishi Valley School, Chittoor district (Training is going on). In this context the Mandal Educational Officers in the district are requested to select 2 double teacher schools in each mandal hereafter to be called as “ALA Schools” while selecting the schools the MEOs should follow the criteria for selecting schools as below and choose the school in the annexure. 2. Minimum enrolment of class 1 and 2 together should be 20 to 30. 3. School should have good infrastructural facility with spacious class rooms.